Helen Rosenthal wants to extend "Cooper's Law" to cover all New York drivers in New York state. 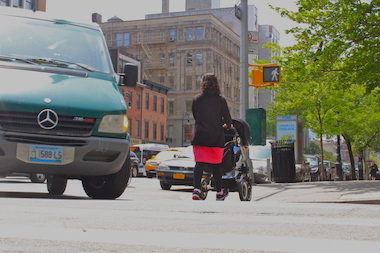 UPPER WEST SIDE — It's not just reckless cabdrivers who pose a threat to pedestrians, according to City Councilwoman Helen Rosenthal. In the wake of the Council's passage late last month of Rosenthal's "Cooper's Law" — which would make it possible to revoke the license of cabdrivers who seriously injure or kill a pedestrian while driving recklessly — Rosenthal has expanded her push to include all drivers in New York state. The measure, which needs to be proposed and passed at the state level, would revoke the license of any New York driver convicted of breaking a traffic law during a crash that results in critical injury or death. Rosenthal plans to introduce a resolution in the Council outlining the plan, hoping to send a message to Albany that "we want you to do what the city did with Cooper’s Law." She would then need state legislators to introduce the bill and get it passed. The councilwoman put in a request to the NYC City Council Legislative Unit to draft a resolution, she said. With language similar to Cooper's Law, the measure would initially suspend the license of a driver involved in a harmful crash who is suspected of breaking a traffic law. If convicted, the driver would have his or her license permanently revoked. Rosenthal introduced Cooper's Law after 9-year-old Cooper Stock was killed Jan. 10 when a taxi driver failed to yield to him and his father in an Upper West Side crosswalk. The boy's mother and Rosenthal were astounded by the lack of consequences for the cabbie following the crash. New York state drivers are also let off the hook in fatal or injurious crashes, Rosenthal said. Under current state law, failing to yield to a pedestrian, running a red light, speeding or breaking any other traffic laws that cause death or serious injuries only results in points on a driver's license and a small fine. If a driver accumulates 11 points within an 18-month period, the DMV may revoke his or her license. It's striking that state law also permits the DMV to revoke drivers' licenses if they are $10,000 in arrears on their taxes, but not if they kill someone while breaking a traffic law, Rosenthal said. She has not discussed the resolution with the office of Mayor de Blasio, who she said committed to passing Cooper's Law and whose Vision Zero plan aims to reduce pedestrian deaths in the city. Rosenthal will invite Community Board 7 to weigh in on the proposed legislation as they did with Cooper's Law. Assemblyman Daniel O'Donnell, who introduced a bill intended to reduce the city's speed limit to 20 mph, is at the top of Rosenthal's list of potential partners on the state level, though she said she has not yet reached out to him. O'Donnell's office did not respond to request for comment. Once introduced, Rosenthal hopes the resolution will move through City Hall quickly, with a vote likely in September after the summer legislative break, she said.